In 2012, a garden was planted to provide nutritious produce for the orphans when they eat at the orphan project on Mondays, Wednesdays and Saturdays. The women who work in the garden have planted mustard greens, tomatoes and pumpkins. Everything is growing well. Unfortunately, some nearby elephants liked the taste of the pumpkins, too, so the children didn’t get to have any in 2012. 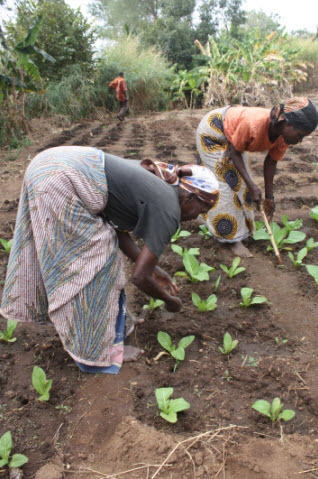 The women that work the garden volunteer their time to plant, fertilize, water and tend to the plants. However, if there is extra produce, they sell the excess and share the profit. This garden has multiple benefits. It provides nutritious produce for the children and also allows the women to have an income. Currently, they rent the land for the garden but due to the recent purchase of a small parcel of land by the project, they might move the garden to this new land. This new parcel of land is adjacent to the orphan project and close to the well.